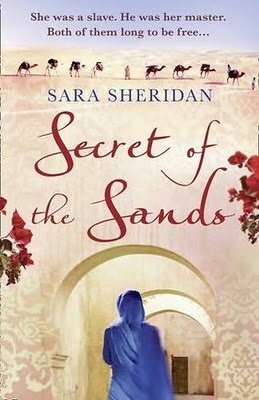 I am currently reading Secret of the sands by Sara Sheridan, a Rich and epic novel, Set in 1833 and featuring a young and ambitious British Navy Lieutenant named JamesWellsted who is serving aboard HMS Palinarious and is currently helping the British Navy survey the coastline of the Arabian Peninsula until One day two of His shipmates go missing while gathering intelligence, so Wellsted decides to mount a daring rescue mission. Along the way Wellsted meets Zena, a headstrong and determined young Abyssinian beauty, who was torn from her remote village, and is now being offered for sale in the market of Muscat, where slavery is still rife. By an unexpected twist of fate her fortunes change when she finds herself the property of the Lieutenant and She accompanies him on his hazardous rescue mission through the shifting sands and into forbidding territory where danger faces them at every turn and they must endure heartache and uncertainty little knowing what fate and fortune awaits them. Each will be forced to make a life changing choice. A rich and epic novel that will appeal to fans of The Pirate’s Daughter and East of the Sun.